This Anzac Day, April 25th, send a tribute with our heartfelt Laurel Wreath. Featuring freshly picked laurel leaves, 3 Silk Red Poppies and a quality purple satin Ribbon with the symbolic words of LEST WE FORGET. They are assembled on a foam base that does not support water, so it is best to order your wreath for delivery no more than 24 hours before you require it to be used. Anzac is in remembrance of our loved heroic heroes lost in Gallipoli on this one memorable morning. Anzac Day Memorial, They shall not grow old, as we who are left grow old, Age shall not weary them, nor the years condemn, at the going down of the sun, and in the morning, we will remember them. LEST WE FORGET. ANZAC Day is one of Australia`s most important national commemorative occasions. It marks the anniversary of the first major military action fought by Australian and New Zealand forces during the First World War. You will find Dawn services being held across the country at various RSL Clubs, Leagues Clubs, Memorial Halls and open air venues. 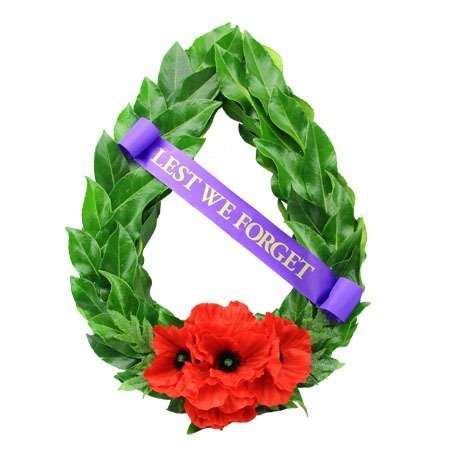 Order online, or call 1800 66 66 46 to order an ANZAC DAY Wreath Tribute today. 2015-05-17 Service rating : Easy website navigation and online payment service. Product : Unfortunately the wreath arrived with no ribbon and only 3 poppies, where the photo on the website had several more poppies. I did contact Flowers for Everyone and this was rectified, a ribbon and a couple of poppies were couriered to us within a few hours.